Description of Property: Le Marronnier is well-equipped and enjoys total privacy with its own parking and entrance road separate from the owners'. 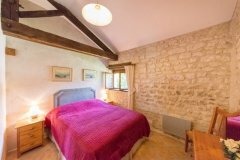 The inside of Le Marronnier has been beautifully restored from a nineteenth century farm stable block to present a host of glorious, exposed stonework and old oak beams. 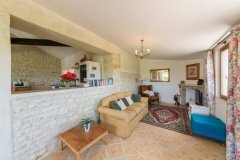 The gîte is tiled throughout and it benefits from electric central heating and a log-burner coupled with good insulation. 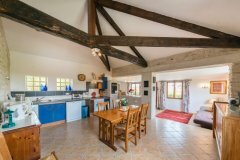 The gîte is spacious and it enjoys a well-equipped kitchen. Fast/free WiFi throughout. Le Marronnier has a flat screen satellite TV (English and French channels), DVD, stereo, microwave, cooker, washing machine, dishwasher and internet access (fast WiFi) together with a private patio (with teak furniture) and BBQ for dining alfresco. Le Marronnier has a large, well-equipped open-plan kitchen/dining room with comfortable seating/dining for 6 adults (there is a large, new sofa-bed in the lounge/diner). 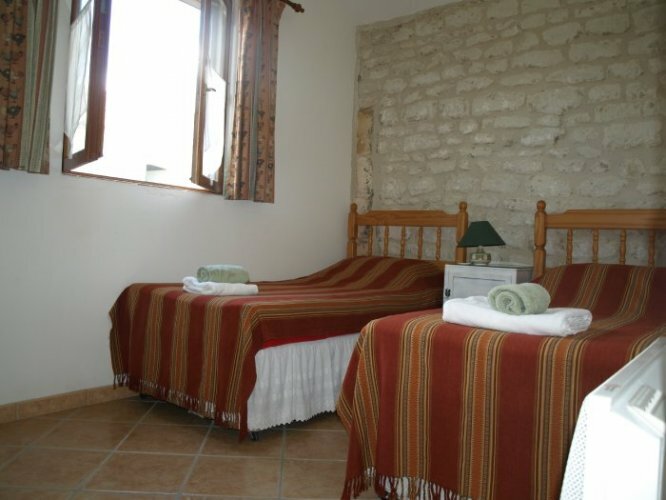 There are two bedrooms, one with two single beds and one with a king-size double bed. Cot available at no additional cos. There is a well-appointed shower/wet room. Outside Amenities: Le Marronnier enjoys a private 30m² terrace which leads onto our 6 acre field of shrubs, grass and wild flowers. 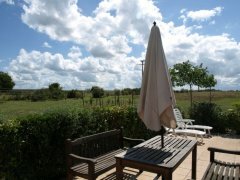 Le Marronnier is equipped with good quality teak garden furniture and a BBQ. Tenants will have shared us of our 12x5m swimming pool, our gym, boule court and children's play area. Surrounding Area: We live in a quiet hamlet (Les Morinauds) on the edge of the pretty village of Brives sur Charente in the 'Petite Champagne' near Cognac. The next village is only two miles away. Our secluded, rural setting is perfect for walking and cycling and generally getting away from it all! Nonetheless, we are just ten minutes from Cognac, 15 minutes from Pons, 20 minutes from Saintes and only 40 minutes from the coast. 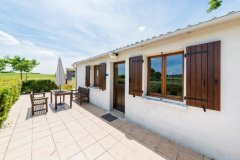 The nearest Golf courses are Cognac, Saintes and Royan. There is a mouth-watering choice of places to visit locally (the beautiful beaches of the Cote Sauvage, Royan, La Rochelle, Cognac, Pons, Saintes, Angouleme, Bordeaux, La Palmyre Zoo and sleepy villages) and a host of activities, including walking, cycling, fishing, canoeing, horse-riding, golf, tennis, swimming and surfing. You can enjoy a relaxing walk or cycle ride to the nearby villages for your breakfast croissants or bread. 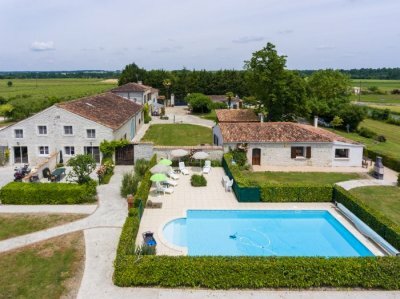 The surrounding area has a great deal to offer from the buzzing town of Cognac (lots of cafes and boutique shops, not forgetting the world-famous distillery tours - Hennessy, Otard, Remy-Martin, Martell and Camus! 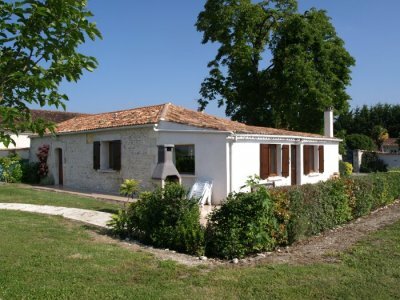 ), to the beautiful ancient towns of Pons and Saintes. Weekly markets are held in Cognac, Pons and Saintes. There are a multitude of local restaurants and bars all within an easy drive or bike ride. The beautiful beaches of St George-de-Didonne and St Palais-sur-Mer are a 30 minute drive way and La Palmyre Zoo (one of the biggest zoos in Europe with over 1600 animals to delight all the family) is about an hour's drive. Central heating (Electric). Log-burner in the lounge. Pricing Info: Payment by bank transfer in advance, with an additional £1,000 rental payable as a refundable security deposit for damages/cleaning deposit to be paid in advance. Prices are in sterling but can be converted to euros at the time of payment. Utilities are included (electric and water); logs are not included. Linen is not provided.